On the seabed of the Gulf of Cadiz, at depths of between 800 and 1200 meters, there are low temperature, methane-saturated emanations of fluid that build the so-called mud volcanoes. Once the methane rises towards the surface of the seabed, it is subjected to microbial activity that transforms it, freeing bicarbonate ions. These reactions facilitate the precipitation of authigenic carbonate that forms rocky substrates, like chimneys, crusts and slabs, therefore creating a great diversity of reliefs and habitats of extraordinary ecological interest. The Gulf of Cadiz is in the migratory corridor between the Atlantic and the Mediterranean, and is an almost necessary stopover for many species and a significant area for various faunal groups such as cetaceans, marine turtles and seabirds. Complex submarine structures that consist of rocks and slabs as well as tubular and columnar structures up to 4 meters high. These formations are due to the precipitation of carbonates composed of a cement from, principally, the microbial oxidation of methane. This mechanism prevents the methane, the third greenhouse gas, rising to the atmosphere, as there are bacterial mats on the sea floor surface that act as a final methane biofilter in the gas's journey through the water column and later out into the atmosphere. At the same time this facilitates the transformation of the soft sedimentary sea floor into a hard substrate, making it easier for colonial species, like cold water corals, to settle in these areas, which then become hubs of biodiversity. In the Gulf of Cadiz, four mud volcanoes stand out due to their ecological significance. These are Gazul, Anastasya, Pipoca and Tarsis, all of which are located on the upper and middle continental slope. Reefs are hard, compact substrates on smooth, solid bases that rise from the sea floor. They can shelter benthic communities of animals and seaweeds, as well as coralligenous concretions. In this zone it is necessary to highlight the presence of cold water corals, dominated by Madrepora oculata and Lophelia pertusa, which are accompanied by smaller species such as Dendrophyllia cornigera. Additionally, this type to habitat houses other structural species like the gorgonian sea fans Callogorgia verticillata and Acanthogorgia hirsuta, and the sponge Asconema setubalense. Cosmopolitan species typical in tropical and temperate regions, although it may also be found in relatively cold waters. It is characterised by being very gregarious. Its very varied diet includes hake, sea bream, mackerel, octopus, squid, and prawns, among other marine animals. 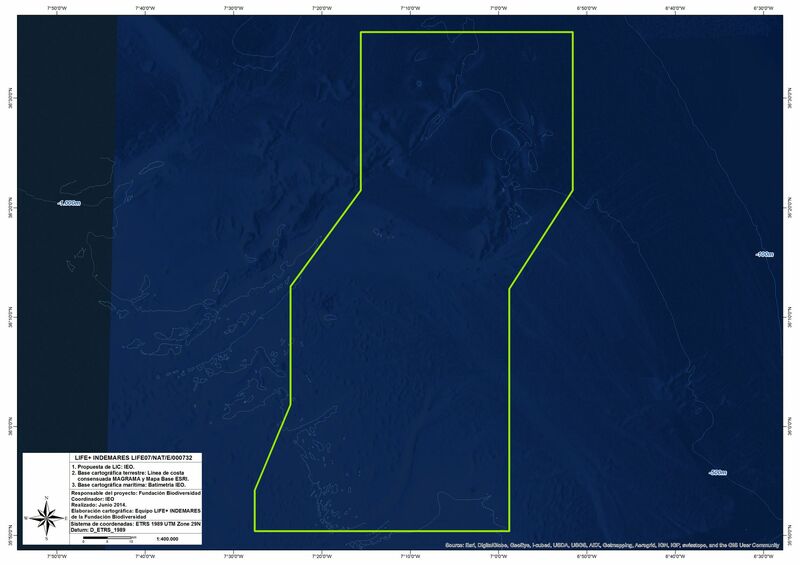 This area has been confirmed to be an important zone for the species, and the presence of two groups of dolphins has been verified, one coastal and another in deeper, or offshore, waters. Cosmopolitan species found in tropical and subtropical waters. Solitary and omnivorous, its diet includes crustaceans, fish, molluscs, seagrass and jellyfish. This region is a particularly significant migratory habitat for the Atlantic population, both for juveniles transported here by the Gulf Stream, and sub-adults and adults that leave the Mediterranean towards their breeding grounds. Species typical of the temperate and cold waters found in the oceans of the northern hemisphere, which usually lives in shallow zones close to the coast. 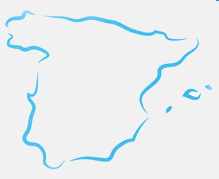 In Spain, it is only found around the Atlantic coastline. During cetacean sampling in the Gulf of Cadiz three individuals were observed. In addition, there have been several cases of beachings involving newborns, which seems to indicate that this zone is the current limit of the species in European waters. A marine species that swims up rivers to reproduce. The populations of this species are in decline in Spain due to the large number of dams in the rivers, which prevent these fish migrating to their spawning grounds. The presence of this species has been confirmed in the Gulf of Cadiz.